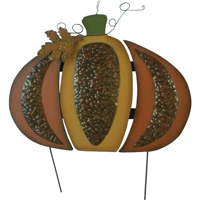 • Each pumpkin is made from wood and colored with the rich shades of orange ochre. Layered on top are cut outs of textured tin in brown ochre. • On top, wire vine and a single leaf complete the piece. • Measures 21 inch wide x 21 inch overall. • Packed 6 per case, $11.00 each.